3G Cardio Elite Runner Commercial-Grade Home Treadmill with 4.0 horsepower motor. The 3G Cardio Elite Runner Treadmill is a heavy duty top of the line treadmill for running. This is a commercial grade treadmill. 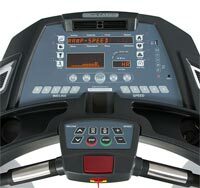 The 3G Cardio brand of treadmills has received high consumer and professional reviews of its products. 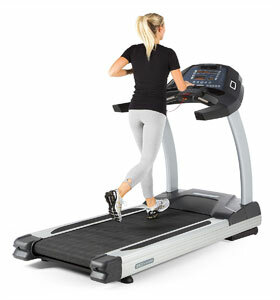 The new Elite Runner model provides all of the latest features along with a super sturdy well made treadmill. The Cardio Elite Treadmill features a powerful 4.0 horsepower (hp) motor (continuous duty) , which can reach speeds up to 12 miles per hour (in increments of 0.5 mph). The treadmill can incline between 0 (flat) to a 15 percent grade with power incline. This model is non-folding which adds to its sturdiness as a running treadmill. Its running deck is a large 22″ x 62″ area for running, jogging or walking. This treadmill is built to last, and comes with the best home warranty we have seen in treadmills. The upgraded orthopedic treadmill belt is thicker and more comfortable than competitor belts. 3G Cardio Elite Runner Treadmill Features: Other features include the OrthoFlex Suspension System (provides shock absorption and support to reduce the impact on your feet, ankles, knees and hips). Pulse grip heart rate monitoring & included wireless chest strap monitoring, and Heart rate programs. The Workout Fan (keeps you cool during your workout). This model includes a LED display with Zero-Glare™ matte finish display, includes windows that can display for speed, incline, time, distance traveled, calories, pulse, and pace. You can use the eight automatic programs (walking or running, a steady pace or intervals, flat or hills), and two customizable programs. Easy to use dedicated incline and speed buttons. Smart-Review Commentary: The 3G Cardio Elite Runner treadmill is our best top rated running treadmill. It is a commercial grade extra sturdy treadmill for the home. For runners and taller users, this treadmill has an extra long and wide running deck (22″ x 62″), and extra strong 4.0 horsepower motor, non-folding and heavy for extra sturdiness, and can handle up to 400 lb. users. The reviews on both a professional and consumer level were excellent on this model. It is loaded with convenience features, and comfort features (cooling fan, water bottle holders, built-in speakers, speed/incline controls). Wireless and Grip HR monitoring are included. The Elite Runner’s 4.0 horsepower continuous duty motor means it won’t be straining to keep up with you. (Straining motors burn out quicker). OrthoFlex Suspension System cushions your impact while running, walking, or jogging. This model goes up to 12 mph, and has up to a 15 percent incline grade with with power incline. This treadmill is built to last and has the best home treadmill warranty we have seen, with lifetime frame & motor coverage, 10 year parts, and 2 year in home labor. The 3G Cardio Elite Runner is not only a Smart-Review Top Pick for treadmills, but has won our BEST of 2019 award for Running Treadmills. Maximum user weight limit: 400 lbs. Description: The 3G Cardio Elite is a true runner’s treadmill. What sets this treadmill apart is commercial grade components, a powerful 4 horsepower motor, a long and wide running surface, and excellent consumer reviews. This model has won our BEST of 2019 award for runner’s treadmills.